Plus, the UN looks at China’s human rights, Chinese netizens talk Crimea, and Michelle Obama in China. China links. The students also issued an ultimatum, calling for Ma respond to their demands by noon on Friday. That deadline has passed, with no change in the situation evident. 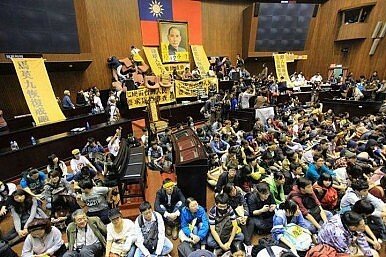 Although one protest leader, Huang Yu-feng, promised to “take further action,” as of this writing it was unclear what the protesters would do next. Meanwhile, legislative speaker Wang Jyn-ping has promised to respond to the students’ demands. Wang has also indicated that he is not considering using the police to forcibly remove the protesters, saying that the students’ safety is the top concern. “For now, I am only thinking of the students’ safety and am not considering having them removed by force,” he told reporters. In other China-related news, during the ongoing session of the UN Human Rights Council, China made headlines by publicly disavowing a UN-commissioned report on North Korea’s human rights abuses. However, the UNHRC session also put China in the spotlight for more familiar reasons: Western concerns over China’s own human rights record. Reuters reported on U.S. and EU criticisms of China for arresting and harassing human rights activists, including Xu Zhiyong and Ilham Tohti. Western officials also expressed concern over the death of Cao Shunli, a Chinese dissident, last week. Meanwhile, the situation in the Ukraine continues to draw widespread media attention in China (and around the world). China’s official response has been covered by The Diplomat, but Chinese netizens provide an alternate perspective on the Crimea referendum. ChinaSmack reports that recently netizens have been comparing Russia’s role in the Crimea referendum with another historical precedent: the Russian-backed referendum that resulted in Mongolia being an independent nation rather than a part of China. Given such history, some netizens argued, the only patriotic thing to do is oppose Russia’s attempt to separate Crimea from Ukraine. Finally, U.S. First Lady Michelle Obama arrived in China Thursday, and met with Xi Jinping’s wife Peng Liyuan today. In a sign of the deep-seated geopolitical ramifications, the Wall Street Journal’s China Real Time blog analyzed the “fashion face-off” between the two high-profile women. In all seriousness, however, Peng Liyuan (famous in her own right as a folk singer) has redefined the role of China’s First Lady. Hu Jintao’s wife was rarely seen in public, much less appearing in the spotlight. By contrast, Peng travels with her husband and has attained status as a Chinese fashion icon. It’s another sign that Xi Jinping aspires to be a different sort of Chinese politician—a charismatic, popular leader rather than a mere font of Party rhetoric. Much of what Ma Ying-jeou and Xi Jinping said was intended to influence a third party: DPP leader Tsai Ing-wen.